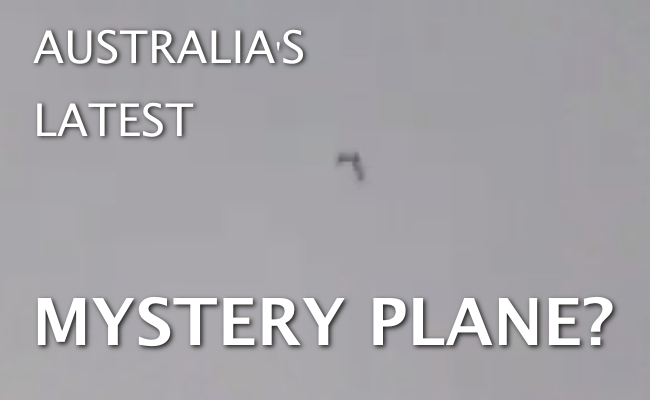 In a video published on May 31, 2014 via YouTube, a chevron-shaped aircraft was filmed moving through the skies above Adelaide, Australia. “It’s going, it’s disappearing now,” one observer can be heard saying as the object apparently drifts further away while being filmed, eventually disappearing behind a cloud bank in the distance. In the still frames below, the object appears to display a metallic exterior, with reflected light or intermittent illuminations becoming apparent as it travels. At the angles most convenient for viewing (see image on the left), the tapered-wings of the chevron shape are quite distinct. The aircraft seen in the images and video above bears some resemblance to this object, photographed by a pilot earlier this year on Good Friday as it passed over Caloundra. At the time the latter images appeared online, we suspected that the illuminated craft, bearing a very close physical resemblance to the Adelaide “mystery plane,” was a remote-controlled hobby plane. Also, the altitude (apparent as the Adelaide aircraft enters the cloud bank) and flight pattern seem to make the possibility of a hang glider unlikely. Have you observed anything similar in the skies above Australia, or perhaps elsewhere? If so, we would like to hear about it. Please send along your photos and commentary via email, and also please consider helping us determine more about the footage by sharing this post using the social network buttons directly below. It’s easy, and only takes a few seconds. Special thanks / hat tip to Mandy Kecks.